Exciting news for everyone planning a visit to Antwerp with kids! 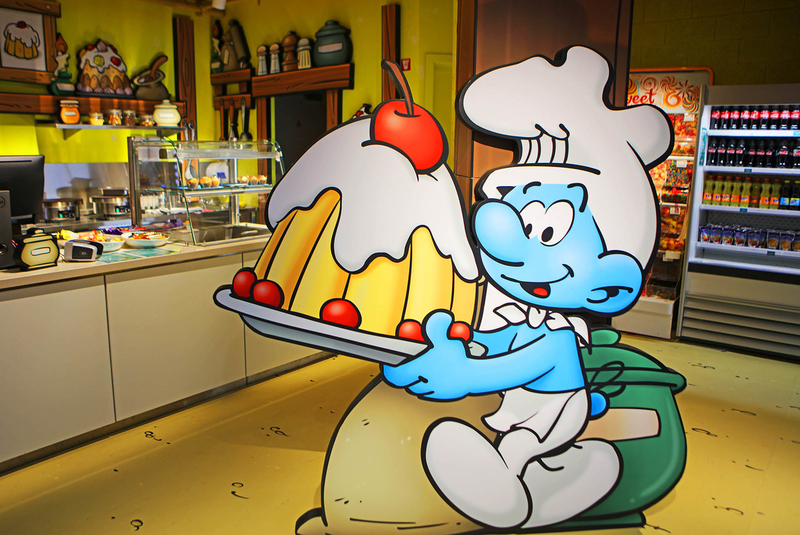 A brand new indoor theme park Comics Station Antwerp just opened its doors in the heart of the city. Located inside one of the most beautiful train stations in the world, Comics Station is a unique concept, the first of its kind in Belgium. We live close to Antwerp and often visit the city with our kids. So we were very excited to hear about this new family-friendly initiative and decided to pay a visit to the Comics Station as soon as it opened. Comics Station Antwerp is a unique experience for the whole family. Not only it is a great place to spend a rainy afternoon with your kids, it also introduces visitors to the most popular Belgian comic heroes. Comic strips occupy a very important place in the Belgian culture, and some Belgian comic characters are widely known all over the world. At Comics Station Antwerp you will not only meet the most popular characters like The Smurfs or Lucky Luke, you’ll get to know Spike and Suzzy (Suske and Wiske), Jommeke, The Kiekeboes, and many more. Even if you know nothing about Belgian comic strips, you will still be able to enjoy the visit to the Comics Station. It offers a great combination of an indoor playground and a theme park in one, with plenty of fun activities for young and old. We didn’t really know what to expect when we first arrived at the Comics Station Antwerp. It seemed a bit confusing at first and we didn’t know where to start - the kids were so excited, they wanted to try everything at once. With more than 60 different activities spread over four floors and six theme zones, there is a lot to experience! No wonder it felt a bit overwhelming at first. The first thing that gets your attention is the biggest indoor slide in the world. With over 22 metres high and 51 metres long, it’s a thrilling experience you will not quickly forget. Not sure if you can handle it? Why not try the shorter of the two slides first. Downstairs you will also find a mini slide for the youngest family members. Furthermore, you will find all kinds of interactive games and challenging activities that bring comic stories and characters to life. Step into the time machine with Spike and Suzzy and try to find your way back by solving all kinds of assignments, including a foggy laser adventure. Afterwards, grab a magic stick and help The Smurfs keep Gargamel and his cat Azrael away and prepare a party in The Smurfs forest. For more thrills, try one of the mechanical rides, or fight the Daltons along the side of Lucky Luke. Our kids also thoroughly enjoyed an indoor playground that stretches over several floors. The short 3D film featuring Lucky Luke was one of their favourites as well. This is only a short preview of what you can expect to experience at the Comics Station Antwerp, with even more interactive and creative activities coming in the near future. Whether you live in Belgium or are just visiting for a few days, don’t miss Antwerp. There is so much to see and do in this beautiful city. Comics Station is yet another great addition, certainly for families looking for a fun way to spend a couple of hours in Antwerp with kids. • Comics Station Antwerp is conveniently located right at the back of Antwerp’s Central Station. It’s therefore extremely easy to reach, even if you are coming from outside of town. On top of that, kids under 12 travel free on Belgian trains. • Comics Station is fun for all ages, and ideal for kids of 4 to 14 years old. • We visited during Easter vacation and while it was quiet in the morning it became rather busy in the afternoon. I would advise to visit in the morning so that your kids (and you) have more time to explore everything. • There are several dining facilities at the Comics Station. • Unfortunately, there is no free Wi-fi available at the moment. • Comics Station is open on weekends, Wednesday afternoons, and during Belgian school holidays. Jurga lives in Belgium and shares her family travel experiences and travel tips on her blog Full Suitcase.